Democratic Unionist leader Arlene Foster is set to hold talks with Theresa May in Downing Street to finalise an agreement on propping up her minority government. The DUP confirmed that Mrs Foster would be going to No10 on Tuesday after discussions in Belfast over the weekend were said to have made “good progress”. Downing Street initially said on Saturday that an outline agreement on a “confidence and supply” arrangement had been reached with the DUP which would be put to the Cabinet for discussion on Monday. 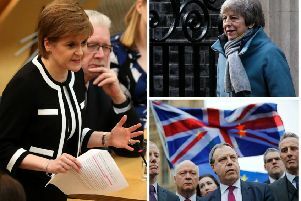 But it later disclosed that no deal had been finalised and talks on the arrangement will continue during the week as Mrs May desperately tries to shore up her position after losing her Commons majority in the election. In another sign of the dangers facing Mrs May, Sunday papers reported that Boris Johnson was either being encouraged to make a leadership bid in an effort to oust her, or actually preparing one - a claim dismissed as “tripe” by the Foreign Secretary. The 10 DUP MPs could prove crucial in supporting the Conservatives on key votes after Thursday’s election saw Mrs May lose control of the Commons. A confidence and supply deal would mean them backing the Government on its Budget and confidence motions, but could potentially lead to other issues being decided on a vote-by-vote basis. “It is an absolute shambles that the Tories claimed to have struck a formal deal with the DUP, only to now admit that no such deal was in place. Theresa May’s government is in absolute chaos. She added: “The PM’s private reassurances are worthless given her track record of u-turns and her clear desperation to cling to power. Meanwhile Ireland’s foreign minister said Theresa May’s desire to team up with the DUP does “not necessarily” undermine the Northern Ireland peace process. Charlie Flanagan said he has raised the matter with Northern Ireland Secretary James Brokenshire, although it remains to be seen what deal is agreed between the Conservatives and Arlene Foster’s party. Mr Flanagan was asked about suggestions that any Conservative deal with the DUP would undermine Westminster’s impartiality as a co-guarantor of the Good Friday Agreement, also known as the Belfast Agreement. He told ITV’s Peston on Sunday: “Well, not necessarily the case. Of course, it remains to be seen what the nature of that deal is. “But this is an issue I did address the evening before last with Secretary of State James Brokenshire.